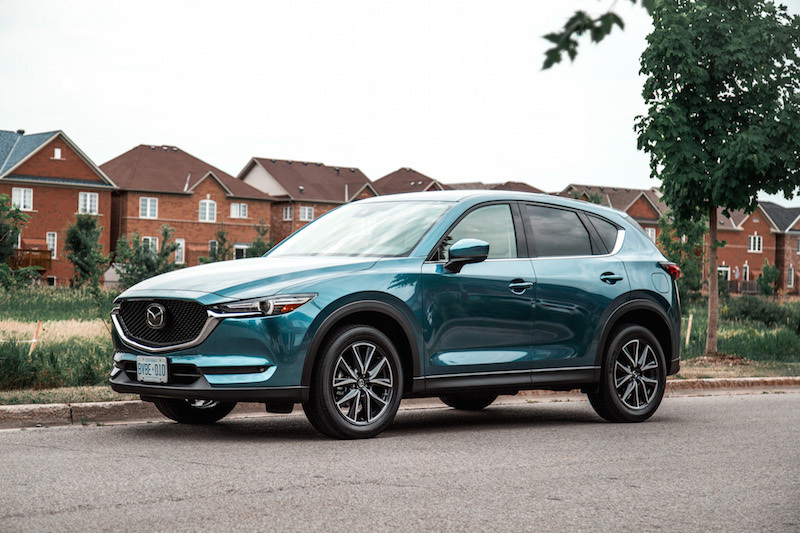 The CX-5 is currently Mazda’s best selling vehicle in 2018, and for good reason. After a week long test, I admired its calm road manners, delightful steering, and intricate interior finish. I wouldn’t mind keeping one of these in my personal garage. 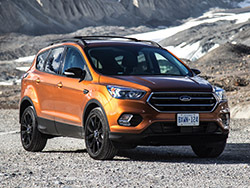 The CX-5 may still be behind in sales compared to global juggernauts like the Honda CR-V, Toyota RAV4, and Ford Escape, but they are certainly selling more than the comparative Hyundai Tuscon, Jeep Cherokee, and Chevrolet Equinox. Not bad for such a small automotive company. 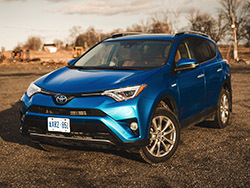 As proven, these statistics are backed up with substance, and people seem to be falling head over heels for this new compact SUV, but it’s far from perfect. 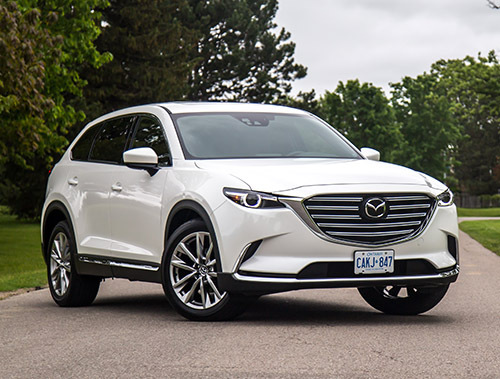 For the 2018 model year, the CX-5 receives a slight exterior refresh, falling in line with the corporate design language set forth by the three-row CX-9. The CX-5 appears handsome, clean cut, and less banal than its rivals. That sleek front nose and how the grill recesses into the hood is clever, and the rear just looks like shrunken CX-9 - that’s a compliment. Aesthetics wise, I’d go so far as to call the CX-5 is the best looking crossover in its segment - the overly angular and messy sheetmetal on the CR-V and RAV4 just don’t do it for me. Inside is just as attractive with a clever use of colours, materials, and positioning. It looks nearly identical to the CX-9, just a bit smaller in every dimension. The steering wheel is a hefty size and the leather wrap feels soft. It’s just a shame that the heated wheel function only warms up the 9- and 3-o’clock positions - sure it serves drivers right for not holding it properly but still an odd omission. The center console is cleverly designed with a deep cubby for your phones and keys, and two average sized cup holders below the shifter. It lacks a bit of versatility in storage space but should be more than enough for your average small family. The new white leather option is a must, and makes this cabin look incredibly upscale, as does all the switchgear throughout. Every dial is wrapped in a chrome finish, and has a studded texture that makes it feel expensive and top-shelf. Even the window switches feel solid and offer that satisfying click when pushed or pulled. 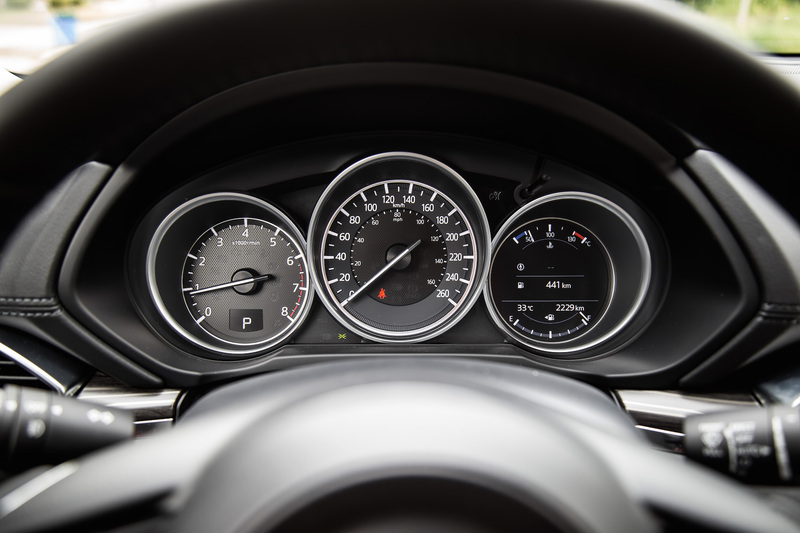 The analog gauges located in the instrument cluster are also one of the most attractive ones in this segment, and beautifully and simplistically light up white at night. The dials are clear and the font is sharp. 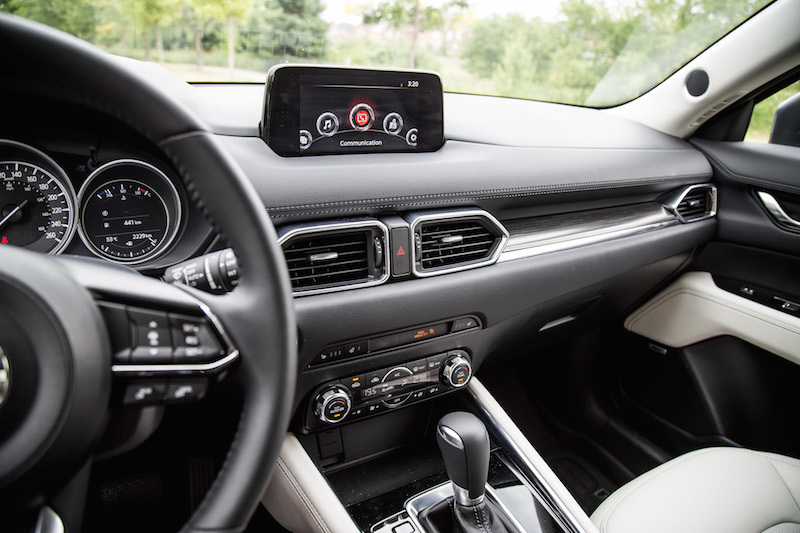 On the other hand, the pop-out display screen on the dashboard is unbearably small compared to its competitors, though the interface is fairly simplistic and easy to use with the help of a rotary dial and buttons on the steering wheel. The driving position is nothing spectacular - you sit high up with a clear view all around. The seats are soft and supportive but the headrests don’t tilt fore and aft. Visibility is excellent. 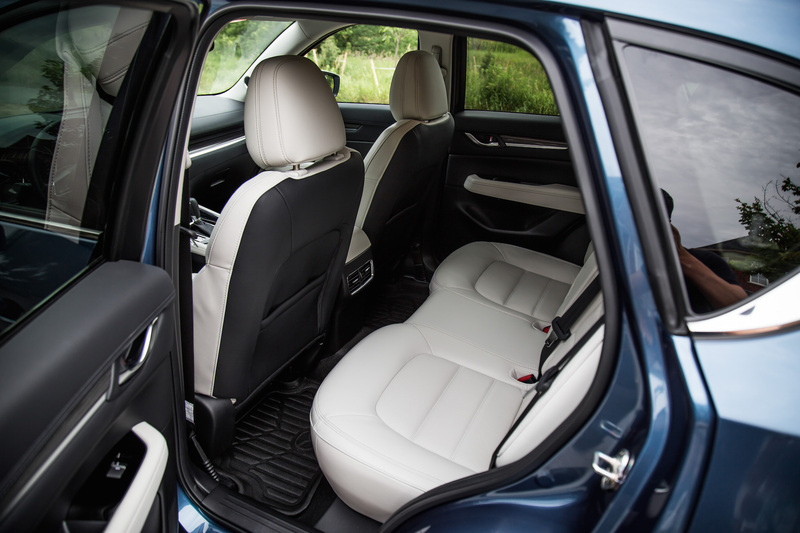 Headroom is spacious in the back, though legroom is not as accomodating as the CR-V or RAV4. 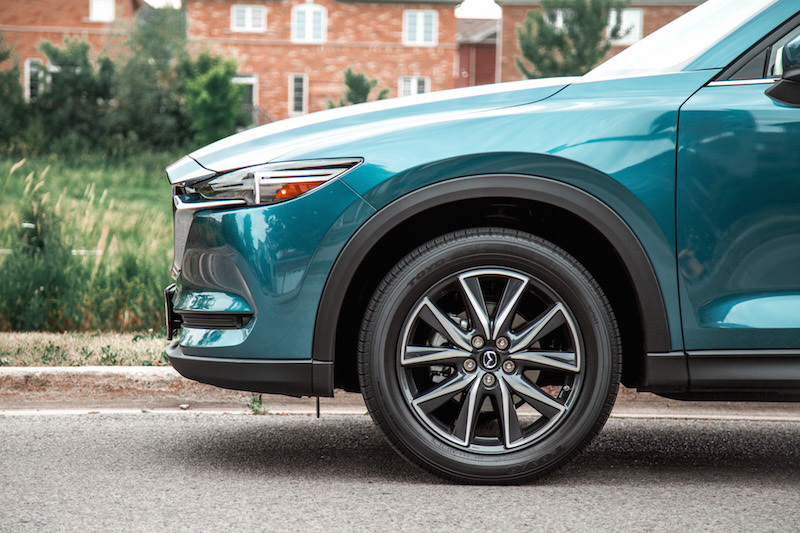 Anyone under six-feet in height should fit fine but if your passengers are part of the 90th percentile, best to look at a CX-9 instead. 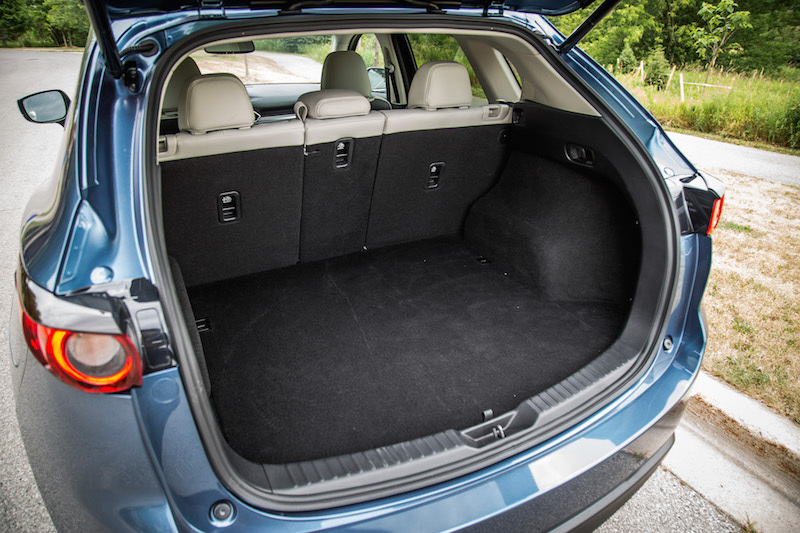 The same goes for storage space, as the CX-5 is sorely lacking in this department compared to its opponents. 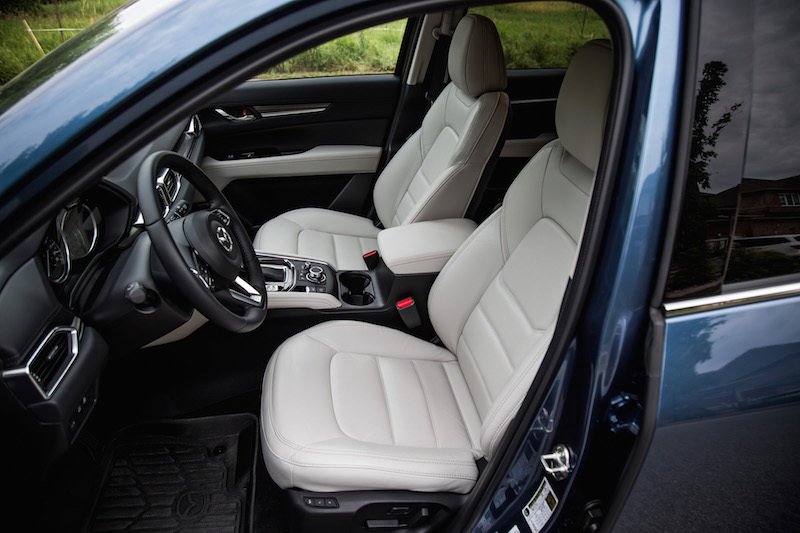 Cabin insulation is excellent with only slight hints of tire and wind noise seeping in. 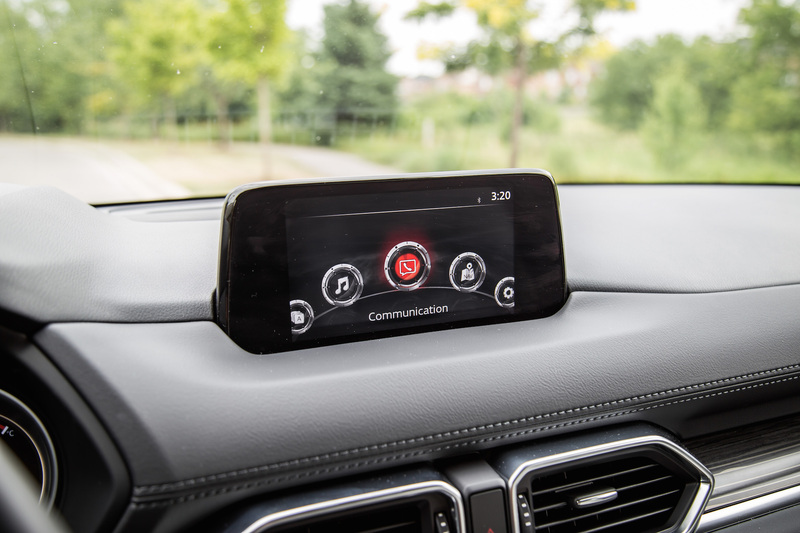 Notable standard features on all CX-5 models include a rear view camera, keyless entry, blind spot monitoring, and rear cross traffic alert. 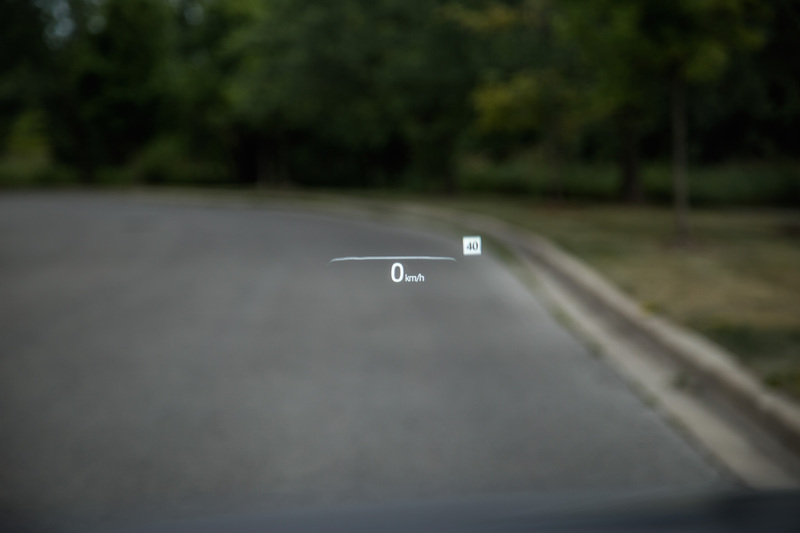 The optional head up display is a neat addition, as not many SUVs in this segment offer that. 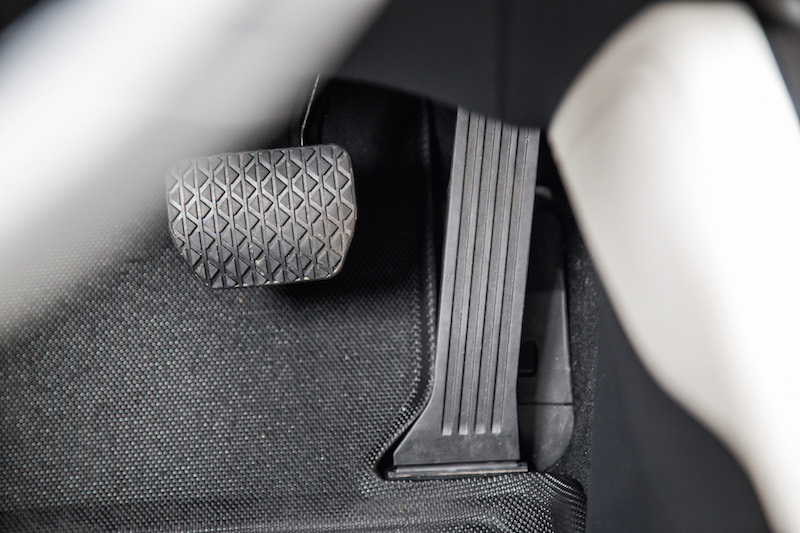 Perhaps my biggest gripe, and possibly a dealbreaker for me, is the positioning of the gas and brake pedals. They are too close together, making it difficult to pivot your heel when moving between pedals. 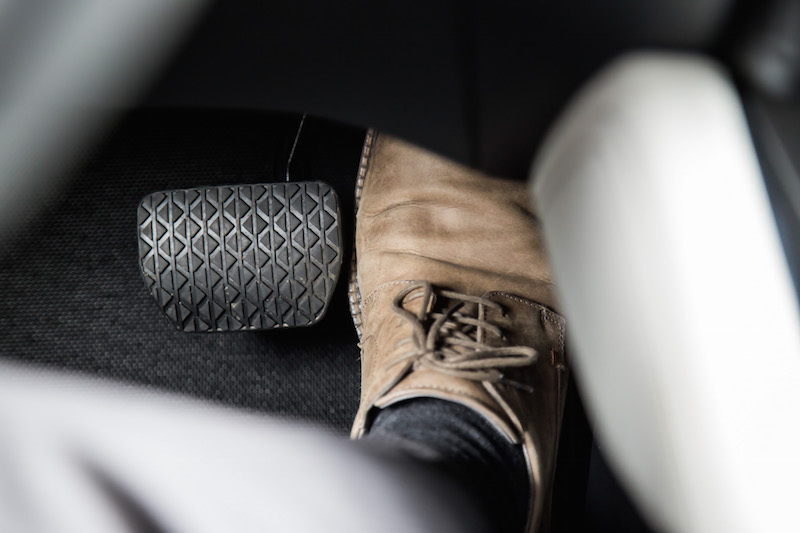 Their close proximity means those with larger feet or those wearing large boots in the winter may find it tricky to hit one pedal without accidentally feathering the other as well, resulting in a cramped footwell that hinders drivers from a relaxing experience. 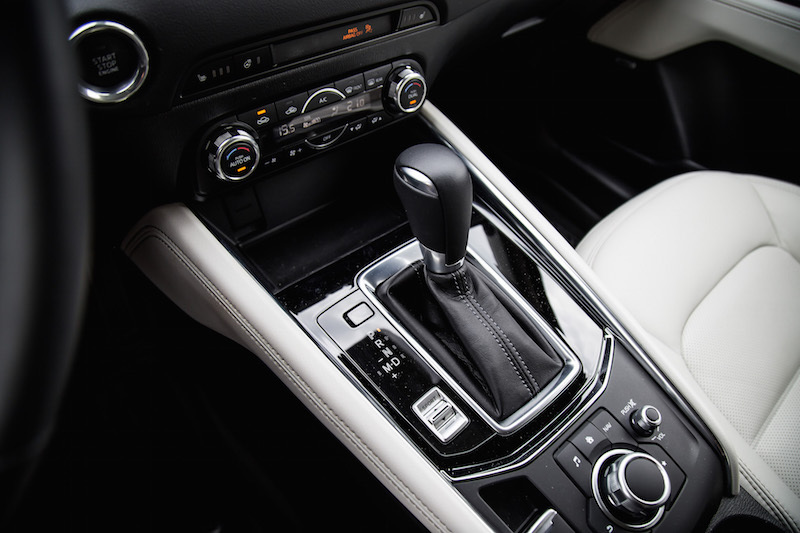 Aside from the mature appearance and relatively upscale cabin, what the CX-5 really has going for it is the powertrain. There are two engines on tap, both naturally aspirated. There is a 2.0-litre inline-four only available in front-wheel drive configuration and with a manual transmission. 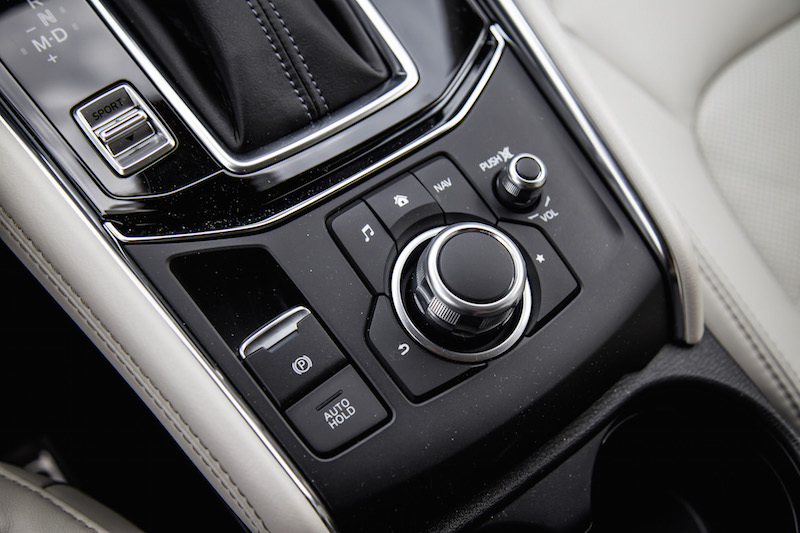 If you want an automatic, the only option you have is the alternative (and volume seller) 2.5-litre inline-four that pushes out 187 hp and 186 lb-ft. Updated for 2018, this free breathing engine now comes with cylinder deactivation, a feature that allows it to shut off two of its cylinders at cruising speeds to reduce fuel consumption. It worked seamlessly, and we averaged an impressive 8.9 L/100km over our week with an equal split of city and highway driving. The actual engine itself isn’t powerful and rather lethargic when compared to anything else with a turbocharger, but I prefer it this way. This inline-four revs up freely and the power delivery comes linearly and predictably. 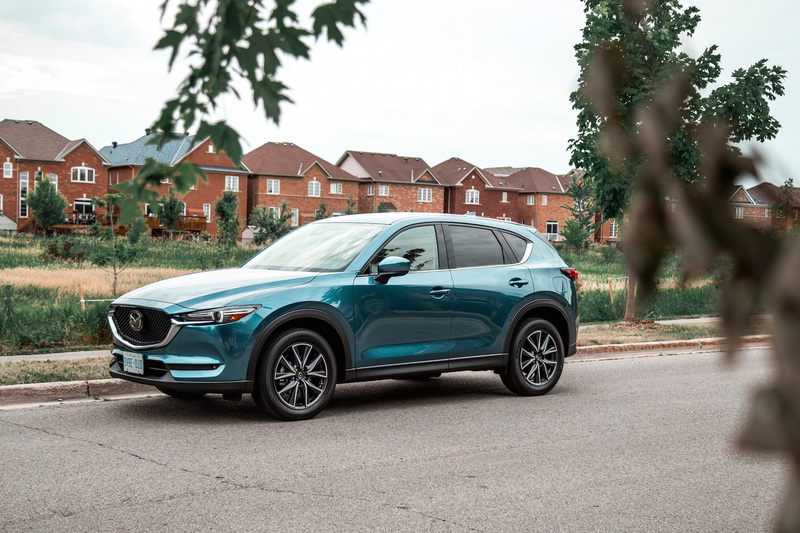 Sure it may feel overly lackadaisical to some, but it is a refreshing powerplant that matches the character of the CX-5, and performs with enough verve and vigour to match the smooth six-speed gearbox and delightfully playful steering. 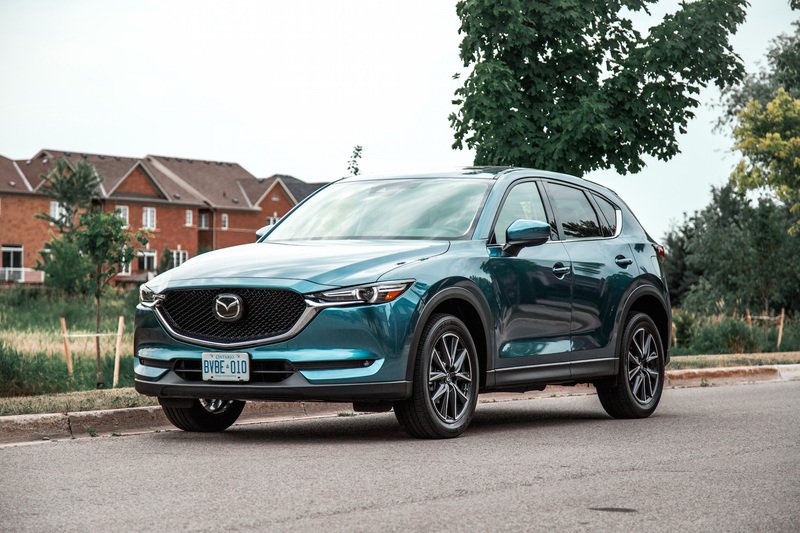 The CX-5 nails all the right points but doesn’t particularly stand out in this growing segment aside from its relatively upscale cabin, mature sheetmetal, and refreshing 2.5-litre engine. 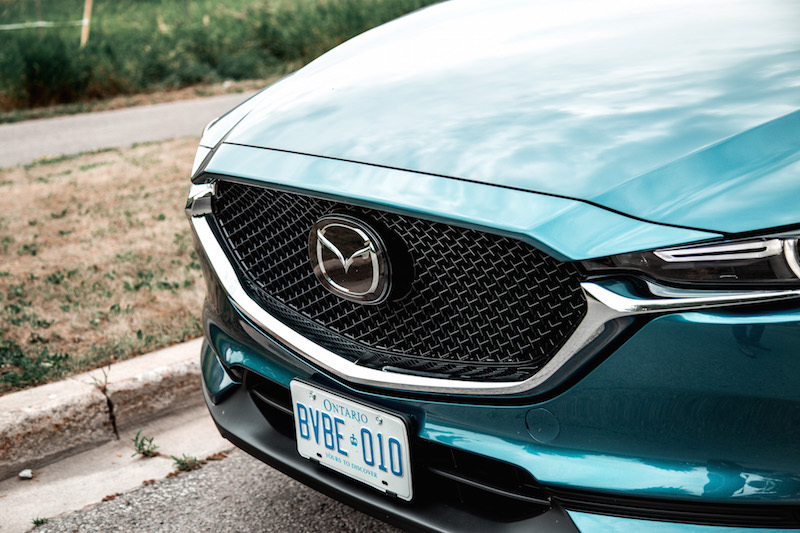 Most will find the CX-5 lacking in power compared to the turbocharged variants of the Honda CR-V and Ford Escape, and their fuel efficiency numbers are rather similar despite Mazda’s addition of cylinder deactivation. 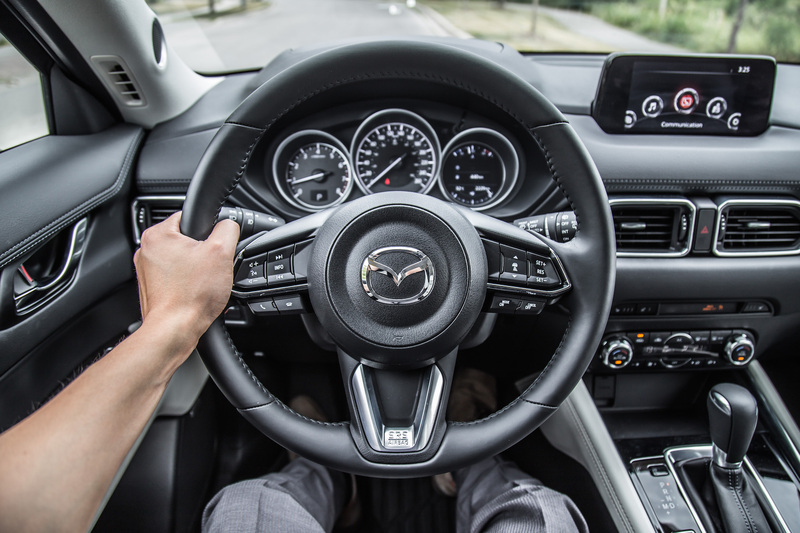 The close proximity of the gas and brake pedals is worrisome, and the cramped cargo space in the trunk hasn’t gone unnoticed. 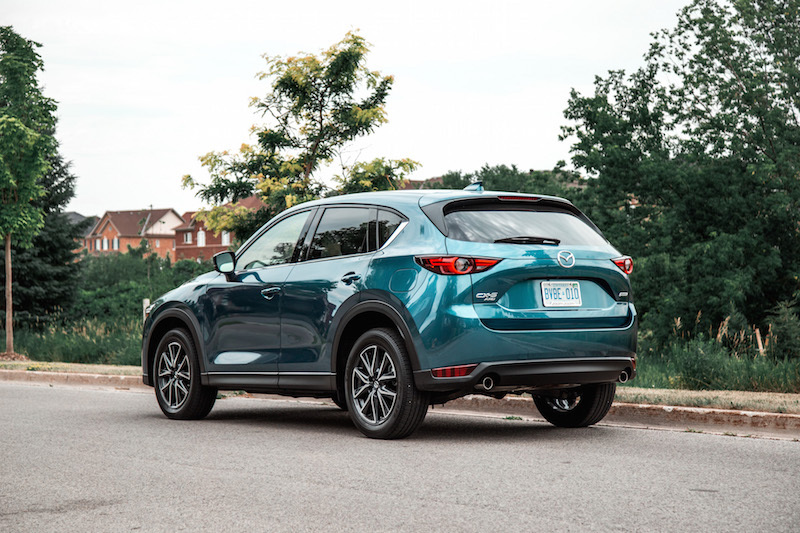 The CX-5 is far from perfect, but it maintains the status quo and exceptionally pulls off a proper crossover with enough charm and chemistry to sway loyal Honda and Toyota customers into the driver’s seat.